Take flight from Mumbai to Istanbul. After your arrival to Istanbul airport, private transfer to your hotel in Sultanahmet area (old city). Stay at Celal Sultan Hotel or similar on Bed and Breakfast Basis. Dinner on your own. Today after breakfast, we will pick you up at 09:00 am, and visit Rustem Pasa Mosque and then walk to the embarkment. We take the boat and cruise for 90 minutes on the Bosphorus. The boat goes by the shores of Bosphorus while your guide specialist on Bosphorus will explain you everything en route. You will see the views of Dolmabahce Palace, Leanders Tower, two suspension bridges, Rumeli Hisarı Fortress, beautiful mansions by the shores of Bosphorus and finally we disembark near the Spice Bazaar. After lunch we continue to Dolmabahçe Palace. Imagine a palace with 285 rooms, 6 baths (hamam), 68 toilets and a ceiling made of 14 tons of gold! Dolmabahce Palace is one such architectural jewel, built by the Ottoman Sultan Abdulmecid between 1843 – 1856, checking out the modern approach to architecture with an essentially French influence. The rich tastes and splendor of the era is evident in every corner and artifact in the decor. You just cannot miss the Bohemian crystal chandeliers, the Crystal Staircase or the largest handmade Hereke rug in the Great Ceremonial Hall. Our guide – expert on 19th century Ottoman history – will take you step-by-step deep to the history of the palace and to its related stories full of legends, myths, and poems. Our last place to visit is Camlica hill on Asian side, which has a top view on Istanbul city. Lunch included in the tour. This tour is a must in Istanbul. You will begin the day with Hagia Sophia. Next, you will see the German Fountain – a gift of Kaiser Wilhelm 2. And listen the stories of his liaison with the orient. Hippodrome, where the chariot races were organized by the Romans and Byzantines, Blue Mosque-the only mosque with six minarets and its surroundings will be our next place to visit. Topkapi Museum is the big one…the most important museum of Turkey and the Balkan Peninsula. It is an incomparably rich treasure-chest, brimming with things of historical importance. First, second, third and fourth courtyards; the Audience Hall, Divan-the High Court, Historical Kitchens, Royal Stables, the Treasury, gardens, kiosks…Probably the best commentary on Ottoman History, art and its culture is simply to come direct to the First Courtyard of this amazing Palace. Hagia Irene Church (from outside). To see these things with a great guide…Well, you will never be quite the same again. Following the visits your guide will take you the Grand Bazaar for demonstration of Turkish Handicrafts. Lunch included. Early in the morning check out hotel, and transfer to Istanbul airport around 05:00 am for your morning flight to Kayseri/ Nevsehir airport. On your arrival your expert guide will meet you at the airport, and private transfer for full day guided tour of Cappadocia. The first stop is Esentepe, the impressive panoramic viewpoint overlooking Goreme history of Cappadocia and the unique rock formations. 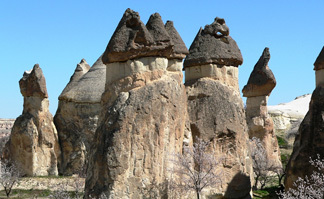 Then proceed to visit the Rose Valley for an easy one-hour hike through fairy chimneys, orchards and vineyards. Further visit the Goreme Open Air Museum, a UNESCO World Heritage site. It will be a guided tour with all information of frescoes in the cave churches, decorated with scenes of the Old and New Testaments dating back to the 10th century. The site has been used as a monastery since the first years of Christianity. For lunch we will visit a lovely restaurant in Goreme. After lunch we make several photo stops along the way – including Urgup’s family fairy chimneys (Three Graces), Devrent’s animal-shaped rock formations and Monk’s Valley with the famous mushroom-shaped fairy chimneys as well as St. Simeon’s monk cell carved into the rock. Day one concludes in Avanos, a picturesque town on river that supplies clay for the 4000 year-old Avanos tradition of pottery. A kick-wheel demonstration by a local potter and your chance at trying this ancient custom brings our day to an end. You will arrive back at your hotel around 5pm. Around 19:30 pm we’ll pick you up from your hotel for Turkish Night Dinner Show/Dance. After show, we’ll transfer you back to your hotel around 24:00 am. Stay at Fresco Cave Suites & Mansions or similar on bed and breakfast basis. Lunch & Dinner included. Optional sunrise hot air balloon flight is a lifetime experience whilst in Cappadocia! Every visitor wants to, and should! Have breakfast at hotel and start for second day full day tour of Cappadocia around 09:30 am. You will visit the amazing Kaymakli Underground City. Carved by the Hittites about 3500 years ago, this multi-level underground city was used by early Christians as a main shelter from marauding enemies during the 6th and 7th centuries. Kaymakli is one of the biggest underground cities in Cappadocia with 8 levels including stables, temples and wineries. After departing Kaymakli, we will drive further south to the magnificent verdant Ihlara Valley. Walk alongside the Melindiz River for about 1 hour which winds its way through the Ihlara gorge, stopping for lunch in a restaurant on the river in the village of Belisirma. After lunch, we continue to the Selime Monastery, the largest rock-cut monastery in Cappadocia with large cave cathedral and breathtaking views over the area. On way back to Goreme stop at the spectacular vista point overlooking Pigeon Valley. Lunch included. Stay at Fresco Cave Suites & Mansions or similar on bed and breakfast basis. Dinner on your own. Breakfast at hotel, check out hotel till 12:00 pm & free in the afternoon. Transfer to Kayseri airport for your direct evening flight to Izmir (departs at 18:55 pm). Upon your arrival in Izmir airport at 20:25 pm, our driver will meet you & private transfer to your hotel in Kusadasi (Bird Island). Stay at Palmin Hotel or similar on Bed, Breakfast & Dinner Basis; Lunch on your own. Breakfast at hotel, and meet your tour guide & driver around 09:00 am, and drive to Ephesus for a full day tour. Ephesus is one of the world’s finest examples of classical ancient city; here you’ll see the Temple of Artemis(Diana), the site of one of the seven wonders of the ancient world, House of Virgin Mary, where many speculate that this is where she spent the final years of her life. Overnight in Kusadasi. Stay at Palmin Hotel or similar on Bed, Breakfast & Dinner Basis; Lunch is included during tour. After breakfast start your tour of Hierapolis Ancient City. It will be a guided tour from northern necropolis to southern necropolis. On the way, you will learn the story of this sacred city and explore its basilica, theatre, temple of Apollo, roman bath, St. Phillip Martyrium and other parts of the city. You will also have a chance to swim in the historical roman pool of Hierapolis. Among these archaeological treasures, the highlight of the excursion will be walking with bare-foot on the travertine terraces. Stay at Colossae Thermal Spa Hotel or similar on Bed, Breakfast & Dinner Basis; Lunch is included during tour. Breakfast at hotel, and our representative will meet you at your hotel for your transfer to Denizli airport. Catch your flight to proceed to Athens via Istanbul.. Arrive in Athens, and Transfer to your hotel in Athens & rest of the day at leisure. Lunch & Dinner on your own. Stay at Athenian Callirhoe or similar on bed and breakfast basis. The establishment of Athens as a city dates back to mythological times. Today’s capital is a result of integration of ancient and medieval history into the contemporary era. Ancient Athens monuments can be found all around the city center, side by side with contemporary construction such as buildings, roads and train stations. Our expert guide will help you to explore the treasures of Athens during your morning sightseeing tour. Beginning with the Panathenaic Stadium where the first Olympic games of modern times where held in 1896 and continue passing by the Temple of Olympian Zeus, Hadrian´s Arch, the Parliament and the memorial of the Unknown Soldier, the Academy, the University, the National Library and Constitution Square (Syntagma) you will be amazed by the rich heritage and how Athens combines the old and the neoclassical in an astonishing way. Your tour will be followed by a visit to the Acropolis, the ancient fortified town of Athens, dating back to the Late Bronze Age, the most famous landmark of entire Greece, the eternal symbol of democracy, education and inspiration. You will also be impressed by the Parthenon one of the world’s greatest cultural monuments dedicated to the goddess Athena, the Erectheion and the Temple of Athena Nike. Enjoy your lunch at local restaurant after city tour. Afternoon at leisure. Dinner on your own. After breakfast our bus will pick you up for a special day tour in Delphi which had the most famous oracle of ancient Greece and was regarded as the center of the world.Passing through the fertile plain of Boeotia, crossing the towns of Thebes which is connected with the tragedy of king Oedipus – Levadia and Arachova we will arrive at Delphi –the Omphalos(Navel of Earth) whose prestige extended far beyond the bounderies of the Hellenic World. On the slopes of Mount parnassus , in a landscape of uparalleled beauty and majesty ,lie the ruins of the Sanctuary of Apollo Pythius. You will be astonished by Treasury of the Athenians, the Theatre, the Stadium and the Museum with the famous statue of Antinoos and the unique bronze statue of the Charioteer dated from 475 B.C and the famous athlete Aghias. We will have our lunch in the modern and picturesque village of Delphi and return to Athens late at the afternoon. Stay at Athenian Callirhoe or similar on bed and breakfast basis. Dinner on your own. After the breakfast we will pick you up and drive to port to embark the cruise ship for the full day cruise at the islands of the Saronic Golf. During our two hours stay in Hydra you can walk along the waterfront, the heart of the town which encounters monuments, churches, canons, museums, old mansions, statues of famous heroes, the old gunpowder store, shops and cafes, while picturesque winding streets lead you to neighborhoods located at the upper part of the town, as well as to the old neighborhood of Kiafas. You will be amazed by the island’s traditional “vehicle” the saddled donkeys. Arriving in our second destination Poros you can visit the famous clock from where you can enjoy the view of the entire island. Enjoy the lunch on board and get ready to explore the largest of the three islands, Aegina. On our way back a traditional Greek folk show with singers and dancers will entertain you up to the final moment as the ship arrives in Athens filling this day with unforgettable moments. Transfer to the port to embark the ferry to Santorini. Enjoy lunch on board (lunch box) Upon arrival transfer at your selected hotel. Balance the day at leisure. Enjoy your day at leisure at the marvelous island with the amazing views. Lunch at selected restaurant nearby your hotel. Breakfast, check-out and per your international flight departure time transfer at Santorini airport . No service is booked/blocked. This is a quotation and final rate will depend on the rates and availability at time of confirmation of the tour. In case the group size exceed beyond 8 adults there will be revision in the cost & the benefit of the same will be passed on to all participants.